The denuded slopes of Massif de la Selle mountain range in Haiti above Jacmel, in 2003. Once covered with pine, cedar and juniper trees, the slopes are on their way to complete deforestation as farmers cut down greenery in the fragile topsoil. A Caribbean island once full of lush trees and teeming with wildlife is nearly completely deforested and undergoing a mass extinction event. Haiti is closer to losing its rich biodiversity than almost any other country in the world, according to new research from Temple University scientist Blair Hedges. He’s spent decades in the rain forests of Haiti, studying new and rare species. Although he’s had many surprises over the years, he said he was shocked by the results of his latest study. In a paper published November in the Proceedings of the National Academy of Sciences, he and his co-authors revealed that Haiti has lost almost all its virgin forests. And because of the deforestation, they estimate more than half Haiti’s species will be wiped out by the year 2035. Using NASA satellite imagery to analyze the landscape, Hedges and his colleagues found the country has only about one percent of its primary forest left, as people have been cutting down trees to farm and to make charcoal for cooking. 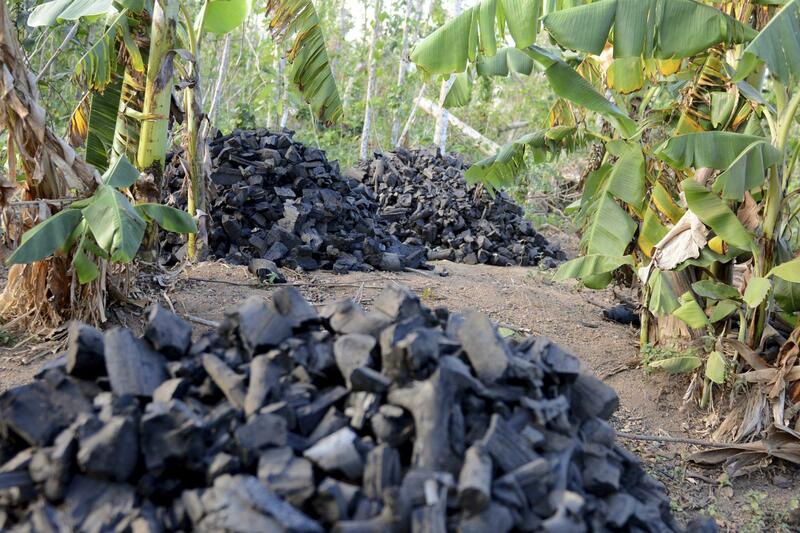 In this 2017 photo, piles of freshly-made charcoal sit in a parcel intercropped with banana trees and other plants, in the mountains above of Les Cayes, Haiti. For decades, authorities and development workers have denounced rural charcoal makers of stripping the nation’s forests, sending topsoil to sea and helping make Haiti the poorest country in the Americas. On a recent December morning, Hedges was in his office at Temple University, where he directs its Center for Biodiversity. He explained that Haiti is at the forefront of a global trend, with species disappearing at 100 to 1,000 times the normal rate. “We’re unquestionably into a mass extinction, globally,” he said. Haiti’s story is largely one of habitat destruction — cutting down trees — but that’s just one of the components in an ongoing, worldwide mass extinction, driven by climate change, invasive species, and other human-related factors. Stuart Pimm, a professor of conservation ecology at Duke University, was not involved in the study but called it a “tragic and brutal” example of what happens when people destroy forests. “I think Haiti is probably the worst place in the world to be a species,” Pimm said. He says that biodiversity isn’t just a nice thing to have. “The natural world provides very valuable services,” he said. Known as ecosystem services, they include things like when a forest, for example, helps to clean the air and water and prevents soil erosion. This became clear to European settlers who cut down many of the trees in the eastern U.S. — including in Pennsylvania, which was almost completely deforested. With so little original forest left in Haiti, Hedges says he’s had to take on a new role — from just being a scientist to also becoming a conservationist. Forty-two of the country’s 50 highest mountains have lost all their virgin forests. He’s leading an effort with an organization he co-founded called Haiti National Trust, which is planning to buy up one of the last remaining mountaintops. “We’re really looking forward to saving, at least this piece of Haiti’s biodiversity,” Hedges said. The purchase would protect an area in southwest Haiti roughly 1 1/2 square miles in size. It’s called Grand Bois, or Big Forest. The valley that is home to the State College area, where the Penn State University Park Campus is located, is sometimes called "Happy Valley." Now Penn State wants to ensure it holds the trademark on the Happy Valley name.